Rina Ariel, mother of the murdered Hallel-Yaffa, speaks about the planned memorial for her daughter, and the work that must still be done. 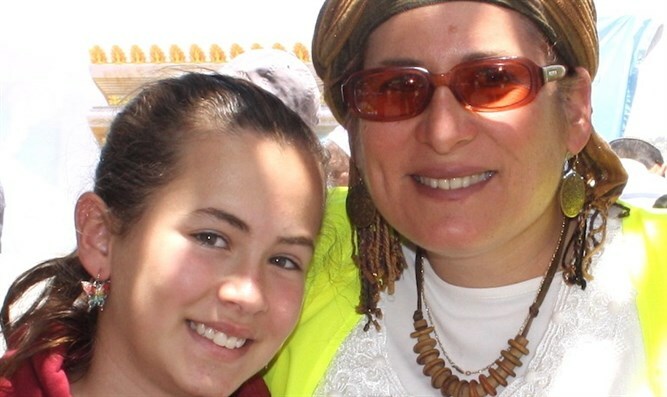 Rina Ariel, mother of Hallel-Yaffa who was murdered in her bed in by a Palestinian terrorist a month ago, told Arutz Sheva about the new memorial project the family is launching. "We're raising 450,000 NIS through a Headstart campaign to establish a visitors center that will display the connection between our family winery and the town of Kiryat Arba as a whole. Hallel loved to work there with her father, and the idea is to call the visitors center 'Hallel's vineyard', where tours of the vineyards and winery and the whole town will be provided." The purpose of the project, says the mother, is to connect the Israeli public with the area, which has a history going back thousands of years. "We work and we cry, the pain is immense, indescribable. It doesn't weaken or fade. But I've chosen to focus on doing. "For example, this evening we're holding an event in which there will be stories about Hallel's life, songs will be played and her friends will perform dance pieces. I've taken it upon myself to organize a women's trip to the Temple Mount once a month in memory of Hallel. The trips will begin at the 'Hallel gate', which used to be called the Mughrabi gate. I've decided to do this in order to strengthen our connection to the Temple Mount." Ariel described how difficult it is to sleep in the house and in the room where the murder occurred. "It's hard, we've been painting and remodeling a bit. Hallel's legacy was that this is her home and she's not afraid, so though it's true that sometimes it's difficult, but this is our place. We have nowhere else to go. "In her room, where her little sisters sleep, it isn't easy for them. We've painted and put up new pictures, we talk to them about how sad we are and how difficult of a time we're having. We need to buy a few new things for the room to replace the things that were taken away because they were too soaked through with blood, such as a carpet, a bean-bag, and a large teddy bear that the girls really loved. This way we can bring back the feeling of home." Ariel also spoke about the video of her daughter's last dance, that affected many people throughout the world. "It really is an amazing video, the night after the murder the singer wrote that song from the depths of his heart and we see it today and cry. He did good aesthetic work in blurring the images of the other girls. "People see it and it touches them deep. We feel like we need to do a lot in order to prevent the next murder, and that is a job that never ends."